Area families of color with students considering college are invited to our Second Annual HBCU Night on Wednesday, January 24 at 6:30pm at Shorewood High School. 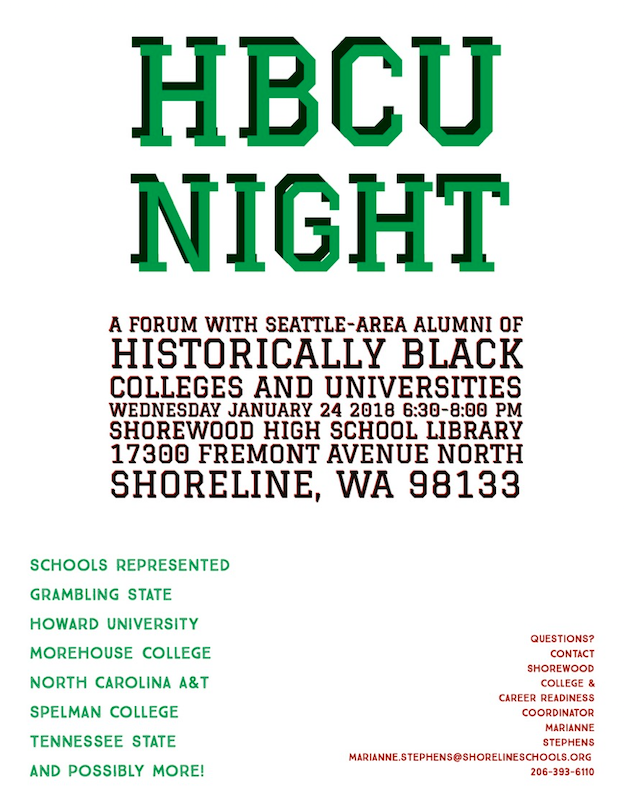 Seattle-area Alumni of various HBCUs will share about their experiences and answer questions. Shoreline School District Director of Equity and Family Engagement Dr. Tanisha Brandon-Felder will moderate the event, which is sponsored by the Shorewood High School Black Student Union and the Shorewood College and Career Center. Any historically Black college or university that was established prior to 1964, whose principal mission was, and is, the education of Black Americans. There are 100 HBCUs, in 19 states, primarily in the South and Southeast. 51 are public institutions and 49 are private nonprofit institutions. Together, they enroll nearly 300,000 students. HBCUs have historically enrolled students other than Black Americans; in 2014, non-Black students made up 21% of enrollment. In 2013-2014, HBCUs conferred 48,200 degrees, primarily bachelor’s degrees (70%) and master’s degrees (16%). Questions about the event can be directed to Marianne Stephens, Shorewood College and Career Readiness Coordinator, 206-393-6110.